It’s not every day that a work of art by arguably the most famous living artist in the world pops up in your hometown. 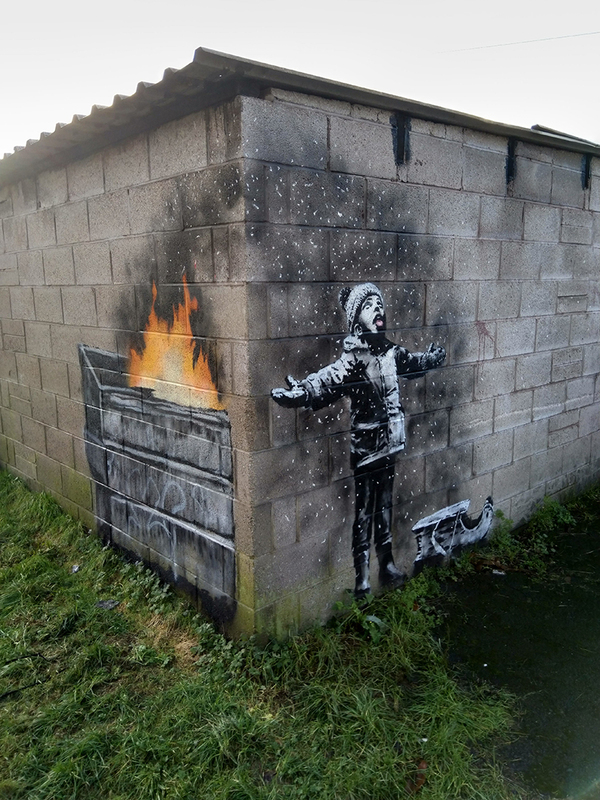 But that’s exactly what happened in Port Talbot when the anonymous street artist Banksy decided to gift the town with an early Christmas present, and thrust the area into the media spotlight at the same time. It came in the shape of a darkly humorous piece of street art spray-painted on the side of an unsuspecting steelworker’s garage. But before the world’s press descended en masse on the until-then sleepy street in Taibach, I’d been tipped off that some new graffiti in the area might, just might, be the work of the stencilling specialist. It’s an area I know well, having grown up just a few streets away from the now-infamous building, and my first thoughts were “yeah, right”. It makes a nice headline, but Banksy in Port Talbot? Highly unlikely. After seeing the work in person, I was a lot less sceptical. I still thought it strange that he/she/they would stop off in the steeltown, but at the same time, it sure did have all of Banksy’s trademark elements. It cleverly utilised the garage walls to give it an almost comic book feel, where by turning the corner it revealed the other half of the story. But more than just the style of the work, it was the simplistic nature of its far-from-simplistic message which convinced me. With enough practise the technique of creating a Banksy can probably be replicated, but what sets the artist apart is the biting satire which oozes from every lick of paint. Either way, Banksy or not, I posted a photo on social media as a “potential Banksy” and went to bed. The next day, it all went a bit bonkers. I woke up to thousands of notifications on my phone from art lovers across the globe, and if it wasn’t the real thing, they were certainly wishing it to be. Thankfully, we didn’t have to wait too long for confirmation, with the artist vouching for its authenticity in a slick Instagram video which also confirmed its meaning – the image of a child in what appeared to be flakes of snow but which were, in fact, ash emerging from a nearby fire, had been painted on the garage due to its direct line of sight with the towering furnaces emerging from the town’s main source of employment, the steelworks. in an adjoining caravan. The road leading to the garage has been closed off by the council, and while it’s great to see so many people stopping off for a look, you have to feel for the locals who are being invaded with a new influx of sightseers on a daily basis. Parking alone must be a nightmare. Much has been made of the works’ financial value, but for me its most important contribution is its social value. From the offices to the cafes to family gatherings at Christmas, people in and around Swansea Bay are talking about the visual arts like never before. Those who might never have discussed the merits of the Old Masters or the Young British Artists now come alive when the conversation turns to the merits of what is, to all intents and purposes, a piece of graffiti, and I think that’s fantastic. Will it inspire some to pursue their new-found interest in the arts further? I don’t know, but if as a result, a handful of people decide to visit their local art gallery, or pick up a paint brush and experiment for themselves, then that can have a long-term benefit far greater than a one-off lump sum. 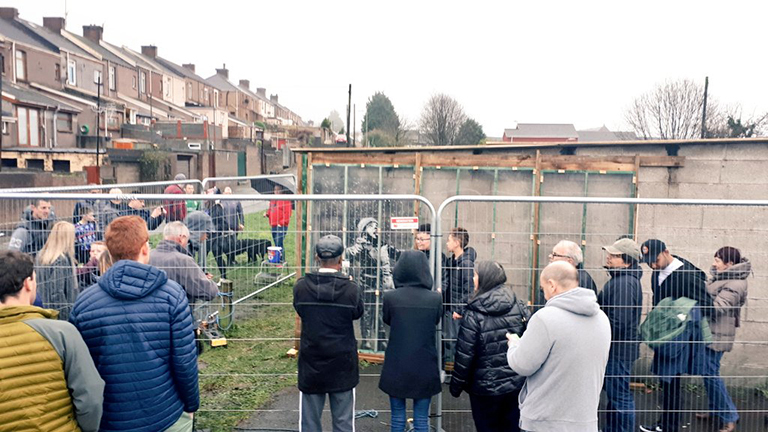 As I write this, the art remains protected by a temporary plastic barrier which was put in place thanks to some generous financial assistance from Port Talbot actor Michael Sheen. But with discussions ongoing and new ideas of what to do with the art being suggested daily, who knows how long it will remain in situ? What I do know is that Banksy has created possibly the most famous, and certainly the most talked about, work of art on Welsh soil. I’ve long banged on about how much I think Port Talbot needs an art gallery of its own, and this could be the ideal catalyst to make that dream a reality. There’s even talk of establishing a national contemporary art gallery in the town, which would be the perfect home for a Banksy in need of protection. In the decades to come, rather than standing proud in the back streets of Port Talbot, this work of art could instead be installed in a New York art gallery, or tucked away in an oligarch’s basement. But whatever happens, we can always say that we saw it at first hand as the artist intended. And if you haven’t done that yet, don’t miss this chance.